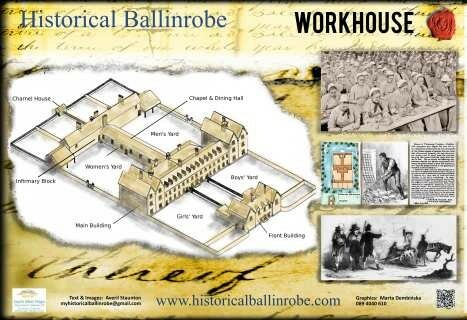 The Ballinrobe Union workhouse was built between 1840/42 and occupied a 6-acre site on the Kilmaine Road to the south-east of the town. The main wall around the workhouse was 7’6” high with the entrance piers 10ft high by 2½ ft square and the timber gate was 7½ft high; admission was strictly controlled. It was designed in the ‘Domestic Gothic’ by George Wilkinson (1814-90) to hold 800 inmates with its first inmates admitted on 26th May 1842. Workhouse conditions were grim, hard and unsentimental, having been set up to cater only for the worst cases of poverty, which discouraged people for entering. Inmates suffered loss of freedom, strict rules and regulation on food, uniforms, talking and endless work with no normal recreation time. The workhouse initially consisted of three main blocks together with other smaller buildings. The reception building housed the entrance hall, with access by a wooden stairs to a board room and clerk's office upstairs. The porter's office and waiting rooms were on the ground floor together with probationary wards. At its rear were privies and fumigation areas together with two yards. On either side were smaller yards that catered for the inmates of the probationary wards only. The reception area was designed as a segregation area to facilitate the complete separation and division of families. This initial contact for people was full of sadness and gave them a foretaste of what was to come! While relieved to have been accepted into the workhouse, it must have been difficult for parents, first to be separated from each other and then from their children aged over two years. In order to gain admission, the complete family had to enter the workhouse together having first handed their meagre plots of land back to the landlord. Men and boys were directed right, women and girls left to a probation ward where they were stripped of all clothing/rags; in some cases the children had no clothes at all. They were then disinfected, deloused, bathed, hair cut and given workhouse uniforms. Paupers were classified into five categories, males or females above 15 years, boys or girls above the age of 2 and below 15 and children under 2 years of age. The Irish workhouse rules stipulated that “each class, or subdivision of a class, shall respectively remain in the area assigned to them; without communication with any other class”. Behind the entrance building, separated by two large exercise yards which controlled segregation, one would find the main three storey dormered building with a long façade, which had double gabled three storey blocks at either end with two ventilation towers. The central rooms contained the apartments of the master and matron together, with the kitchen and scullery, the laundry, drying rooms, work rooms, the nursery and dormitories, which were accessed by stone steps. On the ground floor, to the left, was the girls' schoolroom with the boys' on the right. The children's dormitory was situated over the schoolrooms. The three-storey block at either end contained the wards for the old and infirm. The master and matron’s suite of rooms had two fireplaces each and the walls would have been coloured instead of limewashed. A large store with dressers and shelves was located behind these rooms. The spine linking this main building to the rear building contained the dining hall and the Chapel. One had to eat in silence with severe punishments for breaking the rules; men and women ate their meagre rations separately.To the rear of this spine at right angles was the infirmary which included male and female wards, medical suite, surgery, nurses' room and 'idiot' and 'lunatic' cells. The men's and women's yards were situated on either side of the dining hall. The hospital at the rear of the site was built at a later date. Inmates of good behaviour were chosen to supplement the paid staff and given roles in supervision, as in concentration camps, these tended to be people of harsh disposition. A slightly better food allowance was allowed to these inmates who were often incompetent and negligent, particularly in the infirmary. The other inmates worked at farming, laundry, cooking, kitchen maids, seamstresses, dressmakers, tailors, cleaners, stone-breakers, fire stokers, cesspool cleaners, cobblers, water carriers, disinfectant attendants, rat catchers, repairmen, stock handlers, minor repairs, chimney sweeps and barbers. During the Famine conditions seriously deteriorated, as the workhouse, built for 800 inmates tried to cater for three times that amount, with hundreds dying weekly during its peak. Burial pits at the rear of the workhouse catered for the dead, and fever sheds were built to cope with dying people. Buildings around town and temporary sheds catered for the overflows, including the old Charter School. A hospital was built at a later date and still received patients up until the early 1900’s. Workhouse life improved gradually in the late 1800s. The Mercy Sisters arrival in 1851 contributed to better medical care, with nursing staff having some qualifications. Better food, with a little more variety was introduced, and some recreational time was allowed with outings for the children organised by locals. Newspapers and books together with some entertainments were introduced and the elderly were allowed a small ration of tobacco and snuff, which must have been appreciated in later life. 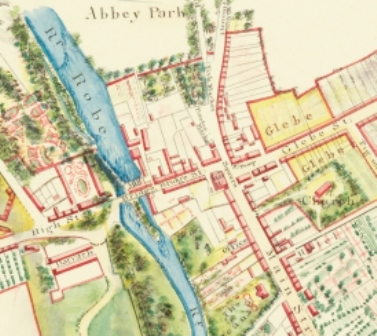 During the War of Independence and the Civil War that followed, a large number of workhouses were occupied by different forces, with Ballinrobe’s having the Republican Army in occupation. Because of the antagonism to and the fear of the Free State Army moving in, part of the workhouse was burned down. Many local people objected to this and were appalled when the chapel and altar were desecrated in this manner. The few inmates left were moved to the County Home in Castlebar and the Boards of Guardians were replaced by County Boards of Health. A section around the old burial pits has recently been seeded as a wild flower garden in memory of those who died at the workhouse, by the local Writers’ Group. This page was added by Averil Staunton on 19/03/2014. Do you know if any girls from Ballinrobe came to Australia under the Earl Grey scheme? My great-grand mother Sarah (Sally) Jennings from Shrule arrived in Australia on the Panama in January 1850. I'm trying to find if she came from the workhouse. Reply: We think about 25 girls were sent from the Ballinrobe Workhouse and will be putting up a list of those names shortly on this site from information relatives in Australia have sent. In the meantime we would appreciate any further information anybody might like to share. Thank you very much for contacting us and hopefully something useful will arise over the next few months. No wonder people came to America!